I have been stomach sick over this gorilla thing. Partly because I am a mom of two little children who could very well have made this same mistake. Because I'm not a gorilla or a little boy or a zookeeper, I naturally find myself sympathizing with the mother. It doesn't make me anti-animals or anti-take-responsibility-for-our-children. I'm just a mom who's sad for another mom. The truth is that we are all one step away from a horrific event like this suddenly happening. I don't for one second think I'm exempt. There is no bullet proof parenting method that protects our children from instances like these. This mother experienced a close call, and we all have those close call moments. They just aren't broadcasted to the world. I have had one of my own close call mom moments. And I can't tell you the number of times it loves to creep back in, keep me up at night, smother me with guilt, and bring me to tears. Sure, nothing happened and everyone is fine. But those close call moments aren't forgotten by moms. It's almost unbearable for any mom to even hold the thought "I could have lost him." But we did lose the gorilla, some of you may say. And you're right, we did. It's very sad. It's sad that we lost this gorilla, a beautiful and rare animal. It's sad that a mom lived out a kind of nightmare that all of us pray to God never happens to our child. It's sad that a little boy fell into a gorilla enclosure, couldn't get to his mom, and was probably scared out of his mind. It's sad that a zookeeper had to pull the trigger. Do I personally think this was handled correctly? Yes. I would shoot a gorilla to save my children and I'd shoot one to save yours. But the whole thing is still awful for all involved. It doesn't matter how you turn it. So yeah, I've been sick about it because imagining my precious Duke in an incredibly dangerous situation that I cannot fix makes my stomach churn. But the other reason this whole incident has been so disturbing is because of the universe's immediate reaction to it all. What is it about our humanity that drives us to want to pick a side, condemn a person, judge a situation, and comment with our "If it were me, I would have _____" following a terribly devastating circumstance? It's like the grown-up version of bullying. Tearing someone down by pointing out all of their mistakes so that we can feel better about ourselves or our point of view. What everyone needs is a good dose of grace here. Grace to the little boy who, like many children, was curious and accidentally found himself in a very dangerous situation. Grace to the zoo who had to make a hard decision. Grace to the person who saved a human's life but who still knows what it feels like to shoot an endangered animal. You wear two very conflicting badges by two different groups of people - Hero and Murderer. I can only imagine what a tough place that has put you in. Grace to the mom for being a mom just like the rest of us. Grace to her as she replays this event in her head and navigates these next days being the target of judgement by many who don't know her. There's a lesson to be learned. And I don't think it's about gorillas or parenting. It's about being the kind of person who gives grace first, not judgement. It is possible to look at this complex situation and find grace for all involved, whether we agree with how it all went down or not. We can still treat people the way they should be treated. No, I don't have the grace thing down. I'm still a work in progress. But I think once we see our own weaknesses head-on, our hands that once held stones release them and find a way to embrace the people around us who are hurting. Take away the gorilla, the boy, the mom, and the zoo. Are you someone who gives grace? If we find ourselves angry at one side, forming petitions, and casting judgements on those involved, it may not be because we're right. 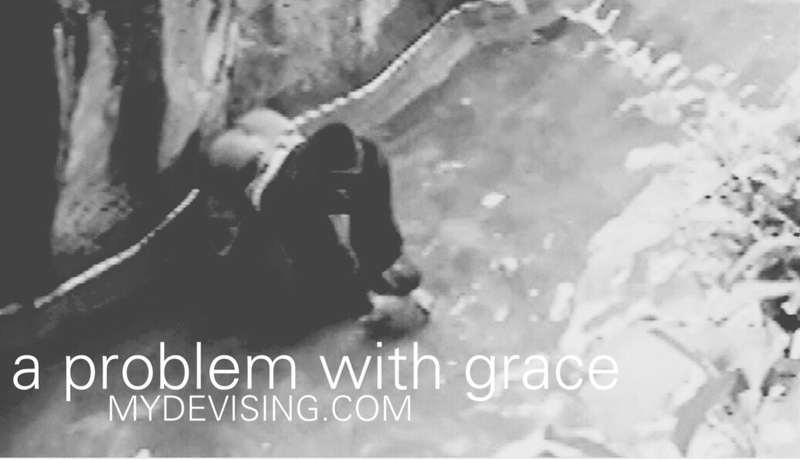 It may be because we have a problem with grace. God, thank you for the many people who have loved me and have shown me grace even when I have made mistakes, lost my temper, said unkind things, been irresponsible, and made bad choices. Thank you for all of those people in my life. Please continue forming in me a humble heart that is fit to love and give grace to others in the midst of their mess. We do have to have grace for all involved. I also think that this just shows how screwed up the world's priorities are. Animals are beautiful creatures made by God, but humans are most important beings, and it's a little twist from Satan to get us thinking that an animal's death is worth freaking out over if it was to save the life of a human. People get furious over a gorilla and yet don't care that we are killing unborn babies by the thousands. It's messed up. Yes, it has brought a lot of things into the light. I feel like I mostly try to avoid the newest story or scandal that social media magnifies, but this one really got to me. It was just such a sad ordeal. Makes me so thankful that this world is not our home!